Third revised edition, loaded November 26, 2013. S'rî S'uka said: 'The gopîs oh King, thus went on singing and speaking deliriously, endearingly weeping loudly and hankering for the audience of Krishna. The son of Vasudeva [or S'auri, 'the Son of the Hero'], the Bewilderer of [Cupid] the bewilderer of the mind, thereupon appeared directly before them, smiling with His lotuslike face and wearing a yellow garment and a garland. When they saw that He, their dearest one, had returned to them, the girls full of affection opened their eyes wide and stood all simultaneously up as if life itself had returned to their bodies. One of them joyfully seized the hand of S'auri with her folded palms while another one put His arm, adorned with sandalwood paste, around her shoulder. A slender gopî took the remnants of the bethel He had chewed in her joined hands and another one took His lotus feet and placed them on her burning breasts. Another one with frowning eyebrows biting her lips threw, beside herself in her love, agitated, sidelong looks at Him as if she wanted to harm Him. Another one [said to be Râdhâ] staring at Him relished His lotus face but could, despite the full taste, not get enough, just like saints cannot get enough of His feet. One of them placed Him, through the openings of her eyes, in her heart and kept embracing Him there with her eyes closed, while her hairs stood on end being drowned in ecstasy, as if she was a yogi [*]. All of them experienced a supreme jubilation at the sight of Kes'ava and gave up the distress of their separation, just like normal people do when they meet a spiritually enlightened person. My dear King, in the midst of those who were relieved of their sorrow, Acyuta, the Supreme Lord, appeared even more brilliant, as the Original Person complete with all His spiritual potencies. The Almighty One took them with Him and arrived at the banks of the Yamunâ. There the auspicious river with the hands of her waves had collected soft sands. 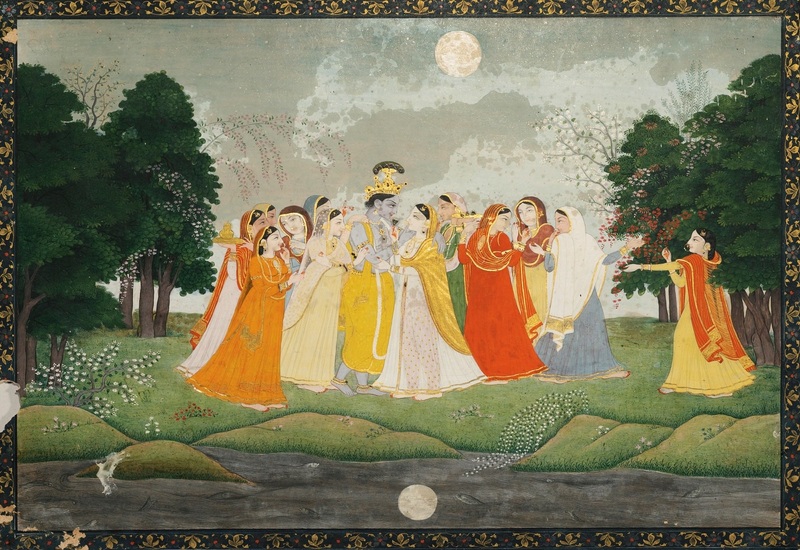 The kunda and mandâra flowers fragrantly bloomed with bees [attracted] by the autumnal breeze, while the moon, plentifully shining, with its rays dispelled the darkness of the night. The pain of the desires in their heart was dispelled by the ecstasy of seeing Him. By arranging a seat for their dear friend with their shawls that were smeared with the kunkuma from their breasts, the gopîs attained the ultimate fulfillment of their souls as [described in] the scriptures [see also 10.87: 23]. The Supreme Lord and Controller for whom the masters of yoga arrange a seat in their hearts, present in the assembly of the gopîs was seated there resplendently. Thus exhibiting His personal form He was worshiped as the exclusive reservoir of all beauty and opulence in the three worlds. He who awakens Cupid, was honored with smiles, with playful glances, with sporting their eyebrows, with massaging His feet and hands upon their laps and was thus offered praise, but still being somewhat incensed they addressed Him. The Supreme Lord said: 'Friends who exclusively to their self-interest reciprocate with respect, are no real friends that way because they in desiring their benefit do not follow the principle. They who are respectful and kind without being respected themselves, like parents e.g., are faultless in their sense of duty and of real friendship, oh slender girls. As for those who have no respect, nor even answer the love they receive from others, one may speak of either [spiritually] self-satisfied souls, people whose material desires were fulfilled, ungrateful, dissatisfied human beings or else persons inimical towards venerable personalities [like spiritual masters and superiors]. But I My friends, despite the respect I receive from other living beings, do not reciprocate that propensity [for pure love] in order to let it increase. Someone will entertain no thought of anything else then, just like a poor man who collected some wealth and is afraid to lose it again [see also B.G. 4: 11 and 10.29: 27]. Because of your for My sake defying of what the people, the scriptures and your relatives all say and because of [My desire to increase] your propensity to love Me, I have answered by disappearing from your sight My dear girls [**]. So do not be displeased with your Beloved, oh dear ones. *: S'rîla Vis'vanâtha Cakravartî Thhâkura states that the seven gopîs mentioned thus far in this chapter are the first seven of the eight principal gopîs of which the S'rî Vaishnava-toshanî in a verse gives the names as being Candrâvalî, S'yâmalâ, S'aibyâ, Padmâ, S'rî Râdhâ, Lalitâ and Vis'âkhâ. The eighth one is understood to be Bhadrâ. The Skanda Purâna declares these eight gopîs to be the principal ones among the three billion gopîs and Râdhâ is, as confirmed in the Padma Purâna, Brihad-gautamîya-tantra and the Rig-paris'ishtha, the Lord's most beloved one. **: Intermitted reinforcement as practiced by Krishna so evanescently here, in fact creates the strongest bond, so confirms modern behavioral science. Thus with all His religions everywhere in the world there are days of materially motivated work where we do not see Him as He vanishes into the background, and days of prayer where we do meet Him by His representatives. from a collection of reproductions by The Yorck Project. Image public domain.